Heckle and Jeckle are cartoon characters created by Paul Terry, and released by his own studio, Terrytoons for 20th Century Fox. The characters are a pair of identical magpies who calmly outwitted their foes in the manner of Bugs Bunny, while maintaining a mischievous streak reminiscent of Woody Woodpecker. However, in a number (perhaps most) of their cartoons (Moose On The Loose, Free Enterprise, The Power of Thought, Hula Hula land) their foes win in the end. Their names were inspired by Robert Louis Stevenson’s famous novella Strange Case of Dr. Jekyll and Mr. Hyde. 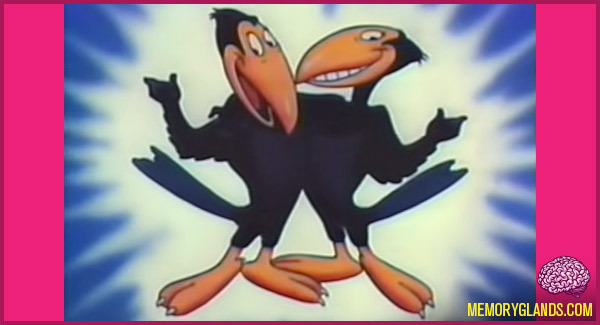 The first Heckle and Jeckle cartoon premiered in 1946.